Today, Wednesday, September 19 is International Talk Like a Pirate Day. Really, it is. For a full explanation, just read last year's post, Avast, Me Beauties!. 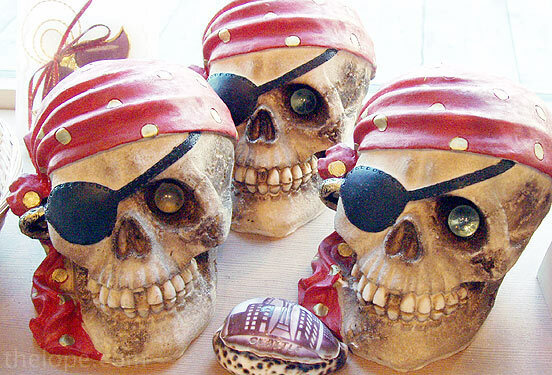 Around here, Talk Like A Pirate Day is no less a holiday than St Patrick's Day. In fact, any day on which I can can speak publicly in a fake accent with less than the normal scrutiny is great...for a day or two, then my friends get tired of it and threaten to make me walk the plank. 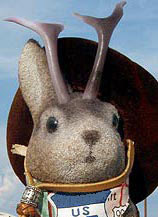 And just as with St. Pat's Day, I hoard pictures all year just for this one occasion. Here they are. 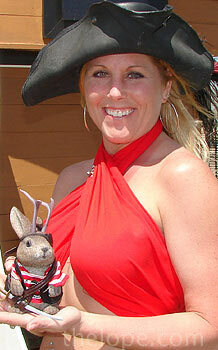 Seattle and Portland are big areas for pirates; they even celebrate the pirate life with festivals and such. Here's some merchandise at Ye Olde Curiosity Shop in Seattle, about a year ago. 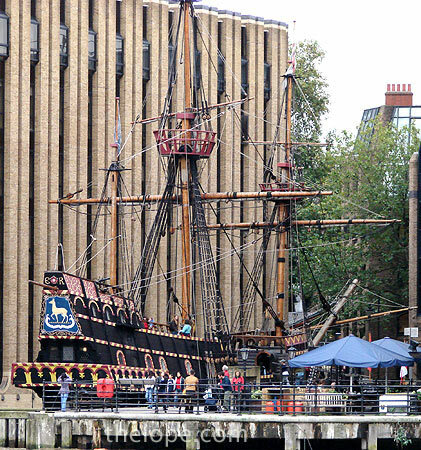 Pirates are big in London, and why shouldn't they be? This one was part of a display in Hamley's toy store last October. But the real history of England is awash with pirates, and not just the freelance kind. 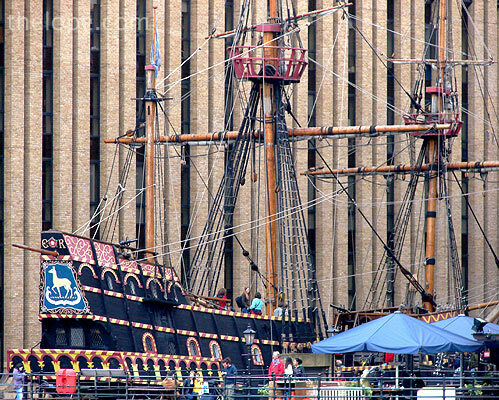 This is a replica of the Golden Hind (aka Golden Hinde), the ship of Englishman Sir Francis Drake (1540-1596). 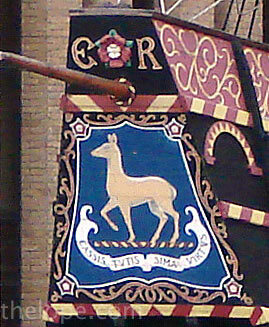 We ran across it on an October tour down the Thames in 2006. 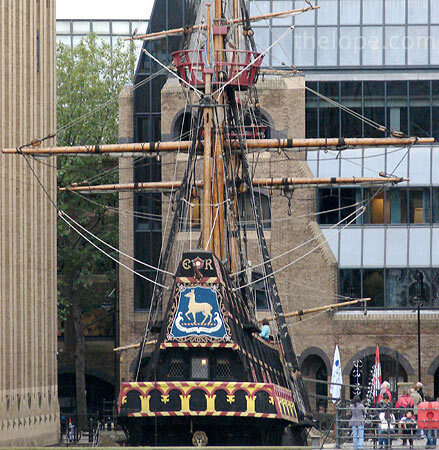 The galleon was originally called the Pelican, but Drake renamed it in 1577 in honor of a patron who used a golden hind (heraldic term for doe) on his crest. The "ER" is for Elizabeth Regina, the English monarch of the time. Whether or not you considered Drake a pirate depended on if his cannon ball was coming toward you - or whether you spoke English or Spanish. 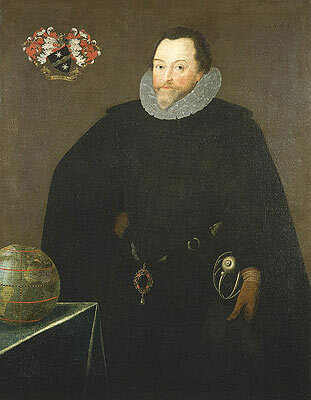 Drake plundered Spanish ships and colonies at a time when England and Spain were not officially at war. Who wouldn't consider him a pirate? 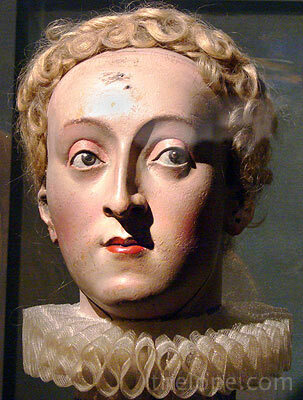 Queen Elizabeth I ("ER", remember? ), that's who. In 1577, Elizabeth (1533-1603) secretly commissioned Drake to attack and plunder Spanish colonies on the American Pacific coast as part of the world-wide power struggle between England and Spain. England eventually came out on top, due in part to Elizabeth's shrewd employment of men like Drake in battles both open and surreptitious. We ran across this 1779 wood carving of Elizabeth by Benjamin Wilson at the Tower of London. Drake's accomplishments were many - first Englishman to see the Pacific Ocean, first Englishman to circumnavigate the world - and he was a real pirate of the Caribbean. Although he is generally regarded as a hero in England, it must be remembered that Drake also helped pioneer the trade of African slaves for the "New World". He died of dysentery in 1596 and was buried at sea in a lead coffin off the coast of Panama. There has been serious discussion of retrieving his body for England. Read more about Drake, Elizabeth and the English-Spanish conflicts here and here. 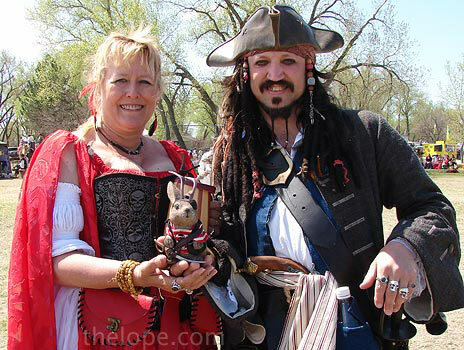 Spring brought wenches, faeries and pirates to Wichita, Kansas, for the Great Plains Renaissance Festival. Pirates were more in evidence than usual, partly due to the popularity of Disney's Pirates of the Caribbean movies. This is Rick Rousseau, whose card identifies him as Captain Jack Sparrow. 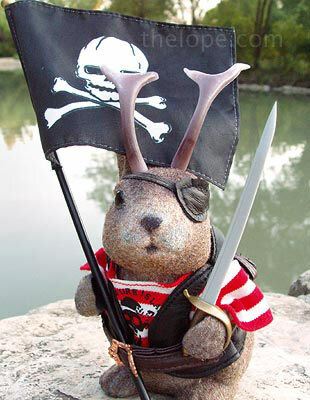 I hope Disney does not regard him as a pirate of a different sort. 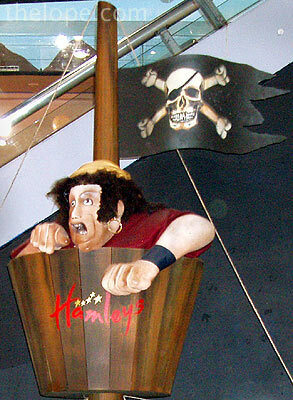 This pirate ship stage was used by the piratical entertainment group Musical Blades. As I noted in a previous post, I like "piratical" as a word. Mind you, I don't know if it's really recognized, but I don't care as it sounds cool and is self-explanatory. They use it on their website and who am I to argue with people with swords and wenches? 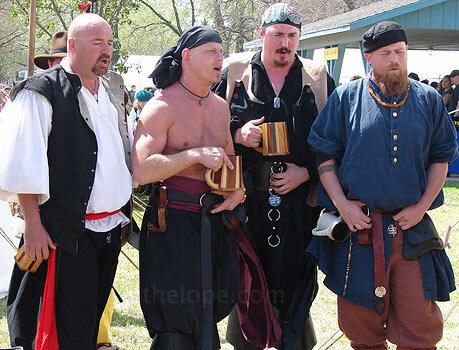 I so seldom feature male pirate-types, but here are some of its members. But enough of that. On to the ships, flags and wenches. This is Sheila of Musical Blades. 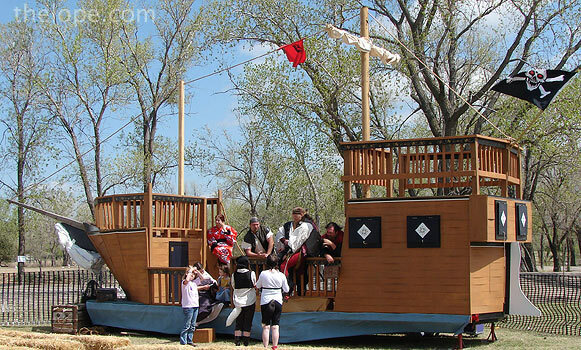 Those of you who enjoy piratical goodness and medievel wenchery might want to check out the 2007 Fall Great Plains Renaissance Festival on September 29th & 30th at Sedgwick County Park in Wichita, Kansas. 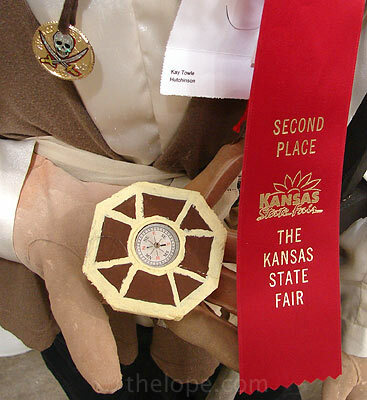 September ushered in the Kansas State Fair, and for the third year in a row, someone made a pirate scarecrow. For the second year in a row, it was inspired by Disney's Pirates of the Caribbean movie series. Although I wish there weren't so many media-inspired entries in this category, I've got to say the pirate stands out. This one was done by Kay Towle of Hutchinson, and featured some fine details. 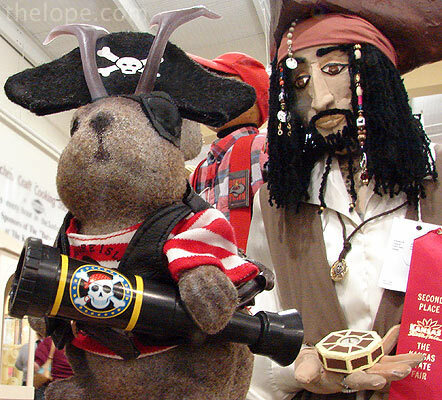 See also the pirate scarecrows for 2005 and 2006. Ace adds to his pirate gear every year, and this time it was a spyglass and a new hat. You can tell the spyglass is for pirates because of the skull and crossbones, although to be historically accurate, an hourglass would have been better. Hourglasses were used on flags to remind those on ships under attack that they had only minutes to decide whether to surrender or suffer more dire consequences. Elsewhere at the fair, the White Water ride was decorated with these painted metal panels. I noticed by comparison to photos from years past that the artwork panels on these things are interchangeable, enabling the owners to adapt to the newest pop culture imagery. As crude as the art is, an exhibit of about 30 years of these things would be interesting. 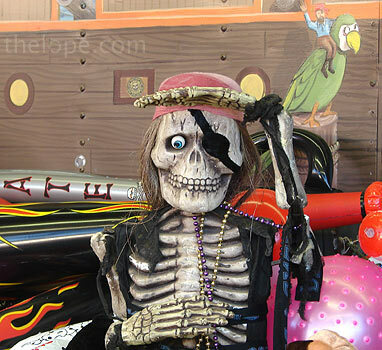 There was a pirate skeleton lurking in one of the carnival games. Why there is a cowboy riding a parrot in the background, I do not know. 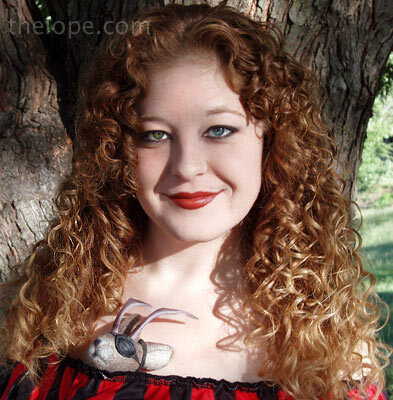 And in conclusion - because some of you have asked for her - here are two previously unpublished shots of Rayne the Pirate Wench. Arr, 'tis the pirate life for me. you saved the best for last, the plank for her!